We've got someone in mind. Because the right dog makes just makes things better. 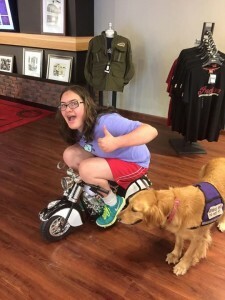 Thank you for visiting Buckeye Service Dogs! Choosing the right service dog provider for you is an essential part of the process of obtaining an assistance, therapy, or seizure dog. I hope the information we have provided here will assist you in your journey. Please feel free to contact us by email or phone. We would be happy to answer additional questions or set up an assessment interview. E-BOOKLET ON SERVICE DOG SELECTION RELEASED! Do you wonder if the dog you have is service dog material? Do you want to train your own service dog? BSD receives calls daily from people wanting to train their own service dog. Perhaps the biggest barrier to success for these individuals is finding the right dog! Most dogs selected by individuals who want to train their own dogs just aren’t appropriate for the work. Sadly, many professional dog trainers also unknowingly select poor candidates and then charge their clients thousands for unsuitable dogs. So, we are offering the booklet Unicorn Wanted! A Practical Guide to Service Dog Selection to address the overwhelming need for reliable information. If you want to select and train your own dog, this booklet will be an invaluable tool. If you are considering purchasing a trained service dog, this information will help you judge whether the dog you are being offered is up to the task. 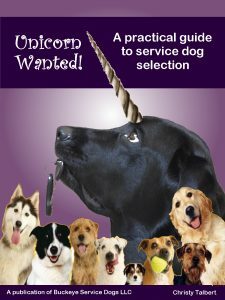 If you want to train service dogs professionally, this book will help you select the best dogs for your clients. You will learn which breeds work best and why; what temperament a dog should have for service work; and how to handle your search and evaluation from first contact with a dog owner or rescue through the dog’s first month in your home. Christy Talbert has 35 years of experience selecting service dogs and has worked with more than 250 teams. We are now interviewing applicants for our 3/19 Co-Train classes. BSD’s next Co-Train session will begin in the fall of 2018. Please click on the Co-Train tab for additional information. We will begin accepting applications for program trained dogs on 3/1/18. Thank you for your patience as we worked through our waiting list. Introducing Operation Co-Train! Do you live in Central Ohio and have the right stuff to train your own psychiatric service dog under BSD’s expert coaching? Operation Co-Train may be for you! Check out the Co-Train link at the top of our home page! We provide several types of service animals. All dogs are custom trained to meet your unique needs. The majority of our dogs are unwanted, throwaway dogs. Some come to us with serious, but curable medical conditions. Others have never had a loving home. By using unwanted animals, we are able to better not only the lives of the consumers we serve, but also save the lives of some wonderful, undervalued animals that deserve a second chance. Assistance dogs are for persons with mobility impairments (wheelchair, crutches, etc. ), or mobility impairments combined with other challenges such as hearing, speech or partial vision loss. Therapy dogs provide companionship and therapeutic partnerships for persons with mental/emotional challenges (head injury, Downs etc.). Therapy dogs may also perform service functions such as picking up dropped objects, depending upon the capacity of the consumer. Seizure Response dogs can respond to a seizure by providing assistance during a seizure. (ie: touching a switch or other device to call for help). engage in behaviors designed to prevent or mitigate outbursts, interrupt self-harm, ease depression, or lessen panic attacks. Seizure Alert dogs may alert to an imminent seizure. About 15% of dogs and 50% of service dogs possess the sensitivity to alert to seizures , low blood sugar, or other conditions before the event occurs. Because of the intiutive nature of seizure alerting, BSD cannot (nor can any trainer) guarantee a dog will alert to seizures. Facility dogs are trained to interact in a therapeutic manner with consumers in residential facilities, hospitals, etc. Diabetic Alert Dogs alert Type 1 diabetics to dangerously low sugar levels. Exercise Due diligence by looking for red flags, asking the right questions, and checking references. If you read nothing else on this site, please read this article! “I have been married to my husband Fred for more than 20 years. Our son Josh recently graduated. Our family pets include River (silver lab), Egan (briard), and Christy’s horse Penny. The remainder of BSD’s team consists of Foster Trainers, Puppy Parents, and some very dedicated clients who continue to remain involved with our work. Many of our Foster trainers are local college students, attending Otterbein, OSU, or Columbus State. Each of our team members receives training and oversight by Christy on a weekly basis. BSD could not serve nearly as many clients as we do without our dedicated team! To find out more, please click on the Foster Trainer/Puppy Parent tab. I began training service dogs as a volunteer for Support Dogs for the Handicapped (founded by Sandy Maze) in the early eighties. At that time, using dogs to assist persons with mobility impairments was a completely new idea. Many years later, I learned that Canine Companions for Independence (CCI) had started in California at about the same time Support Dogs started here in Columbus. While I was working with Support Dogs, I met Sam and Joe Maxwell. Joe was a quadriplegic, and Sam was his wife. Sam, Joe, and I spent hundreds of hours evaluating dogs and trying to figure out the best way to produce a dog that worked reliably and joyfully for a disabled person. There was no experienced person to teach us everything was learned by trial and, especially, error. The training techniques I use today are the same ones Sam and Joe developed early on (although, much refined now). Fledgling organizations are prone to disunity (and drama!). Eventually, Sam and Joe parted ways with Support Dogs, and formed a new organization with the help of a neighbor. This organization was called Happy Canine Helpers (now disbanded). After a couple of years, another split occurred, and Sam and Joe formed Guide Dogs for the Handicapped, which was later renamed Assistance Dogs of America. (As a side note, CCI eventually took over Support Dogs and has a facility in Delaware, Ohio). Throughout all these organizational changes, I continued to train and place service dogs. Often, I did this on a volunteer basis, but I also was employed by Assistance Dogs of America, first, in the late 80’s and later in 1990, first as a contractual trainer and then for several years as Director of Training. When ADAI moved entirely to it’s location in Swanton, Ohio, I didn’t want to relocate, and assumed my days as a dog trainer were over. As it turned out, I continued to get requests to train dogs, and BSD was born.